Sprinkle some fresh thyme leaves over this deeply flavored dish. Prep and Cook Time: 35 minutes. In a large frying pan over medium-high heat, stir bacon often until browned and crisp, 6 to 7 minutes. Add portabellas and stir often until golden brown, about 5 minutes; pour into a bowl. Add leeks, carrot, and celery to pan; reduce heat to medium and stir often until vegetables are soft, 8 to 10 minutes. Return portabellas to pan and add chicken broth, wine, and thyme; simmer, stirring often, until liquid is almost evaporated, about 10 minutes. Season to taste with salt and pepper. Meanwhile, preheat oven to 450°. In a spice or coffee grinder, grind dried mushrooms to a fine powder; pour into a wide, shallow bowl. 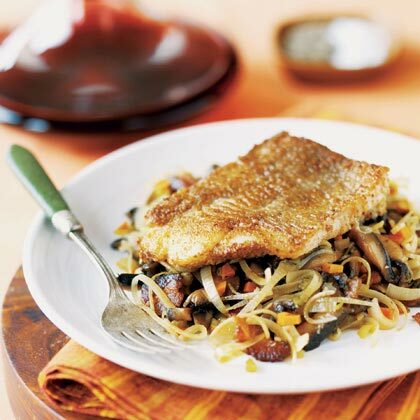 Sprinkle both sides of fish with salt and pepper, then coat with the ground mushrooms. Pour olive oil into another large, ovenproof frying pan over medium-high heat. Add fish and cook until browned on the bottom, 3 to 4 minutes. Turn pieces and transfer pan to oven. Bake just until fish is opaque in center of thickest part, about 8 minutes. Divide mushroom-leek ragout among four plates. Top with fish. Wine pairing: Earthy, smoky Pinot Noir with mushroom notes under dark berry flavors. Best in our pairing: Tandem Sangiacomo Vineyard 2002 (Sonoma Coast; $38), Foxen 2004 (Santa Maria Valley, CA; $28), WillaKenzie Pierre Léon Vineyard 2003 (Willamette Valley, Yamhill/Carlton, OR; $36), and Estancia Stonewall Vineyard 2003 (Santa Lucia Highlands, CA; $30). Flavor bridges: Pinot Noir can be meaty without being heavy and tannic; tender, white-fleshed fish like sturgeon is also meaty but lean (as are portabella mushrooms). Smokiness in the wine plays off the bacon in the ragout, and mushroom flavors--well, Pinot is about the only wine that offers them flat out.